At last, an explanation of the effects of Brexit on the British economy that I can understand: a Pringle shortage! As Brexit looms, Kellogg Co and Mondelez International Inc are taking measures to protect Britons from a potential shortage of Pringles chips, BelVita biscuits and Milka chocolate. With Britain at risk of leaving the European Union on March 29 without a divorce deal – known as a ‘hard’ Brexit – several big companies have begun to prepare for the disruption that could ensue. Kellogg is opening new warehouses and stocking up on its snacks and cereals, hoping to mitigate damage from friction at the UK border and tariffs on imports, Chief Executive Steve Cahillane said in a recent interview…Cahillane said Kellogg’s supply chain left it exposed. For instance, Pringles, the UK’s No. 2 chips (crisps) brand after PepsiCo Inc’s Walkers, are made in Belgium. I guess the British should have thought of that. Alas. While Brexit—Britain’s leaving of the European Union—is in turmoil, the industry newsletter, BakeryAndSnacks.com has a few articles on its effects on this industry. Complicated, no? President Trump has just announced a truce in our trade war with China. We need one. In August, the Trump Administration said it would provide $12 billion to farmers to make up for the losses in income caused by the dispute. I’ve been collecting items about what’s actually happening with the bailout payments. Not much has been paid out: The New York Times reports that the USDA has paid out just $838 million of the $6 billion that became available in September. Another pool of up to $6 billion is expected to become available next month. They are not helping Wisconsin dairy farmers: According to the Milwaukee Sentinal Journal, about 4,800 dairy farms are collectively getting about 80 percent of the $10.4 million coming to the state, with an average payment of $2,390. But the Wisconsin Farmers Union says a 55-cow dairy farm would receive a one-time payment of $725 from the Trump bailout program, but would lose between $36,000 and $48,000 this year due to low milk prices. They are not doing much for Iowa farmers either: According to the Des Moines Register, the 4300 payments total nearly $31 million, with an average payment of $7,236. But 100 payments are less than $25, 24 are less than $10, and 11 are $5 or less. Payments are going to 1,100 city residents; these average $881. According to the Environmental Working Group, the recipients may or may not actually be involved in farming. The EWG got the data from the USDA. The National Corn Growers Association wants more money for corn farmers. Its letter to USDA says the agency does not understand the how badly the trade disruptions are affecting its members. Its own study estimates corn growers losses at $6.3 billion. North Dakota soybean growers have a storage problem, says the New York Times, because they can’t sell the beans to China. Kansas soybean farmers are also in trouble, writes the New York Times. Overall farm income is declining, says USDA. I think it’s fair to conclude at this point that current trade policies are tough on US agribusiness. I am ever surprised by the extent to which Trump Administration’s policies directly harm its core supporters. Two recent reports tell the story. One comes from a group called Tariffs Hurt the Heartland, which has produced an accounting of the losses to businesses in Texas as a result of Republican trade policies—$424 million gone, just in August. Scott Frazier, a south Texas farmer and Secretary-Treasurer of the Texas Farm Bureau, warned that tariffs will have long-term consequences for agriculture by shuttering the foreign markets that farmers in Texas and across the country depend on. One quarter of our agricultural products grown in the U.S. are exported to other countries. The economic well-being of American agriculture depends on maintaining and strengthening our export markets, and farm and ranch families depend on this to survive. This group also has produced an interactive, searchable map at TariffsHurt.com that let’s you find stories of how tariffs are affecting local communities, state by state, and you can learn more about the campaign here. The second report comes from the Brookings Institute. It analyzes the effects of Trump’s trade wars on his base. The report comes with a spreadsheet where you can look up the data for yourself. The retaliatory tariffs differ by trading partner, but there are some commonly targeted industries. All four markets focused tariffs on agricultural products. Agriculture cuts a very specific geography across the United States, particularly implicating metro areas in California’s Central Valley as well as rural areas and small towns in states like Illinois, Iowa, and Nebraska. I thought this was an especially poignant example of food politics from a food systems perspective—looking at the big picture context of what we eat, from production to consumption to waste. China has retaliated by putting import tariffs on US food products, reducing their sales in that country. Because we greatly overproduce food, and depend on exports to sell it, we now have a glut of products that can’t be sold—soybeans mainly, but also pork, apples, cheese, figs, peanut butter, orange juice, and others. The Trump Administration says it will help farmers hurt by the trade dispute by buying their products to the tune of $1.2 billion so far. Food banks have no idea how they can handle all of what will be dumped on them—950 million pounds on top of the 700 million pounds they usually get—because they do not have the money to process and store the donations (one organization says this costs 23 cents per pound of food). The food bank trade association, Feeding America, is calling for $200 to $300 million to pay for distributing the excess burden of food donations. Prevent or end this trade dispute? Ensure that food banks are unnecessary? Alyshia Gálvez. 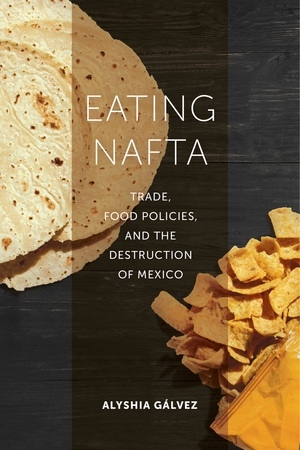 Eating NAFTA: Trade, Food Policies, and the Destruction of Mexico. University of California Press, 2018. This compelling book, by a Lehman College professor of Latin American Studies, links US trade policies to the destruction of Mexico’s corn economy and consequent destruction of Mexico’s traditional food culture, and shows how that destruction affected immigration, the border wall, drug wars, and, ultimately, public health. Mexican food—real Mexican food—“is falling out of reach for many Mexican people,” she says. Trade policies, in this case the North American Free Trade Agreement (just signed), not only affect what people eat, but also their health. Using a Latin American studies frame, we can see that ever since the European conquest, ideas about citizenship, responsibility, and capability in the hemisphere have been viewed through the lenses of racialization, class, and gender. The same social groups viewed in the colonial and early independence periods as incapable of assuming the responsibilities of citizenship happen to be the same people now blamed for their own susceptibility to diet-related illness. Gálvez gave a talk at NYU earlier this week at which she passed around a basket of traditional corn tortillas, obtained for $7 at Whole Foods. They were delicious. These, she pointed out, are almost impossible to get here or in Mexico, having been almost entirely replaced by commercial tortillas, having nothing like the original flavor and texture. NAFTA dumped underpriced US corn on the Mexican market, undercut local prices, and put farmers out of business. Without local corn, mills went out of business. The other speakers at her session, Mireya Loza and Krishnendu Ray of my NYU department, emphasized how NAFTA has induced irreparable losses, not only of small-scale farming and the livelihoods of small farmers and corn millers, but also of the food habits that used to define Mexico’s indigenous foodways. 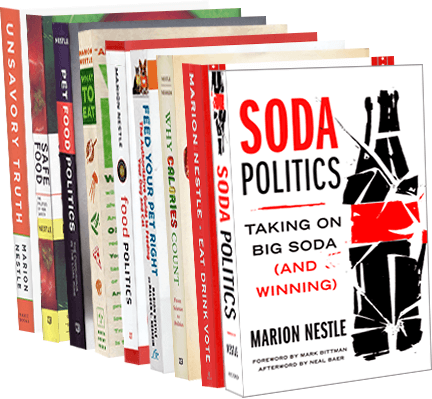 They will be using Eating NAFTA in the courses they teach. Lucky students. If you want to understand what “free trade” is really about—on the personal as well as the political level—this is the book to read. I find the details of trade policy almost impossible to understand (so many arcane rules, so many countries), and am grateful whenever I read something crystal clear. The good news: The European Union is buying lots more US soybeans than it used to. Purchases are up 133% over last year, and now account for 52% of EU soybean imports. The bad news: The EU is buying US soybeans because they are cheap. Because China is not buying US soybeans, there is a glut; prices have fallen by 20%. Estimates are that the EU will buy $2.5 billion this year. But last year, China bought $12.3 billion in soybeans. That’s nearly a $10 billion loss unless other buyers can be found (the estimate is a $7 billion loss). China is now buying soybeans from Brazil, and at premium prices. Here’s what the American Soybean Association has to say about all this. One more indicator: Politico also mentions an article in the Milwaukee Journal Sentinal detailing how more than 2,500 US dairy farmers have resorted to GoFundMe campaigns to save their farms. I wish we grew more food for people instead of food for animals or fuel for cars, and that our agricultural policy linked to health policy. Maybe if we did that, we wouldn’t be in this situation. But GoFundMe campaigns? Maybe we just need real agricultural policies.